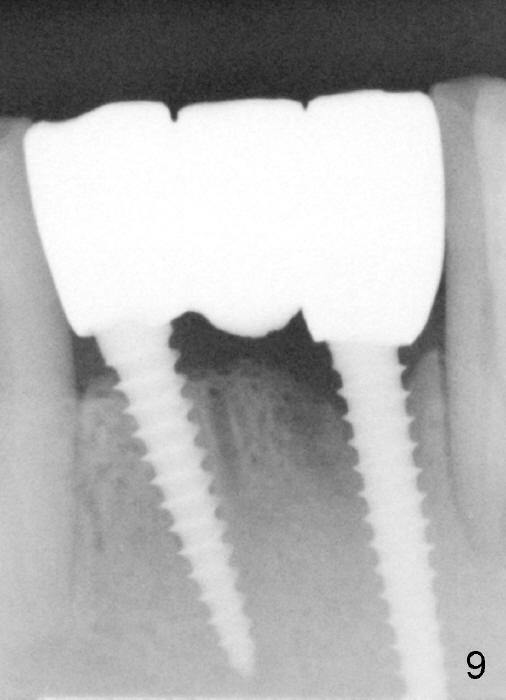 Extraction sockets usually provide sufficient access to immediate implantation. It appears that incision is unnecessary and may delay healing. 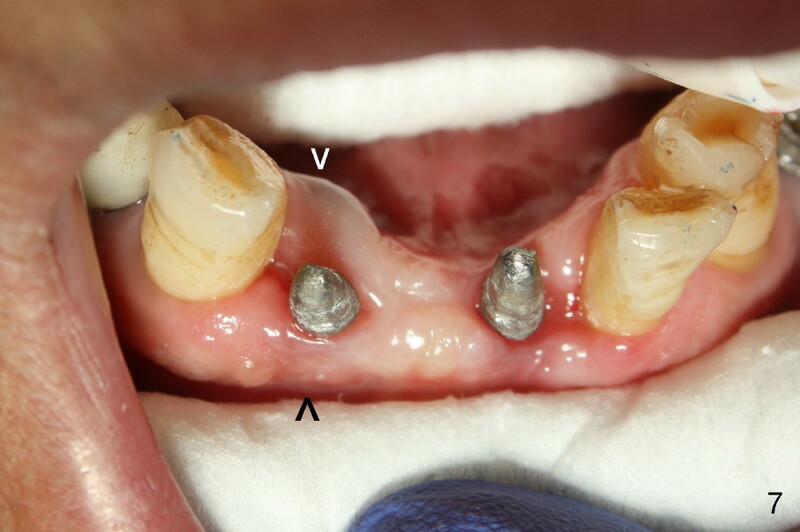 A 67-year-old man has a fixed partial denture (FPD) spanning from #24 to #26 (Fig.1). 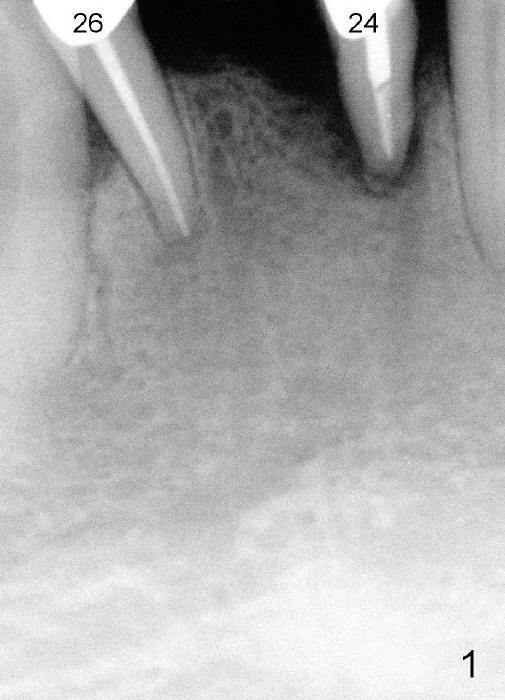 Originally the abutment #24 has endo perio disease. Finally the tooth #26 fractures. 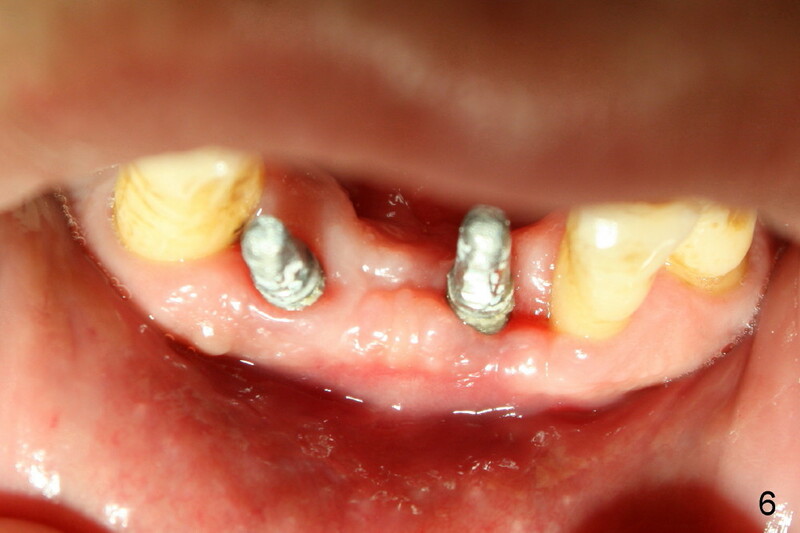 Both of the teeth are extracted and replaced by one piece implants (Fig.2). 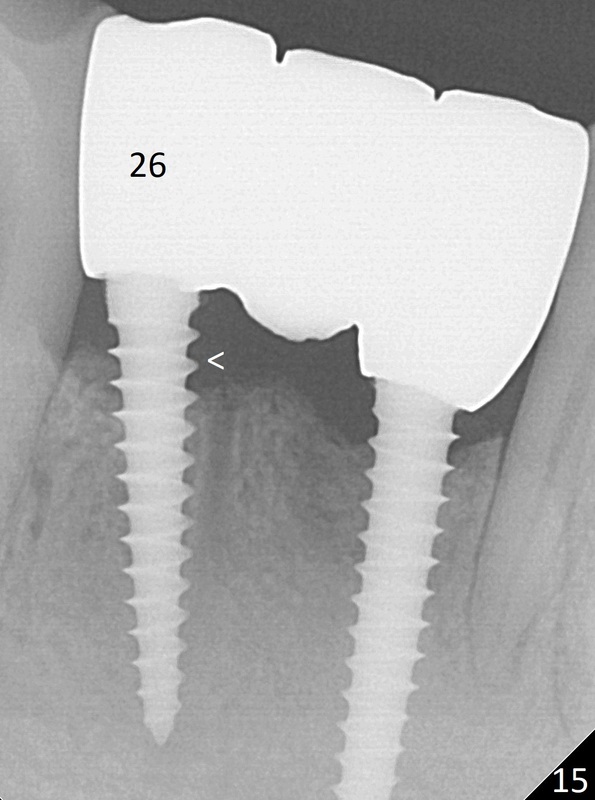 Placement of the immediate implant at the site of #24 is difficult due to the fact that the socket is deep and that surgical visibility is poor. An incision has to be made for the placement, followed by bone graft and collagen membrane. Tension is released prior to suturing. Two of immediate provisionals are fabricated over the one piece implants and a pontic is bonded to the retainers. 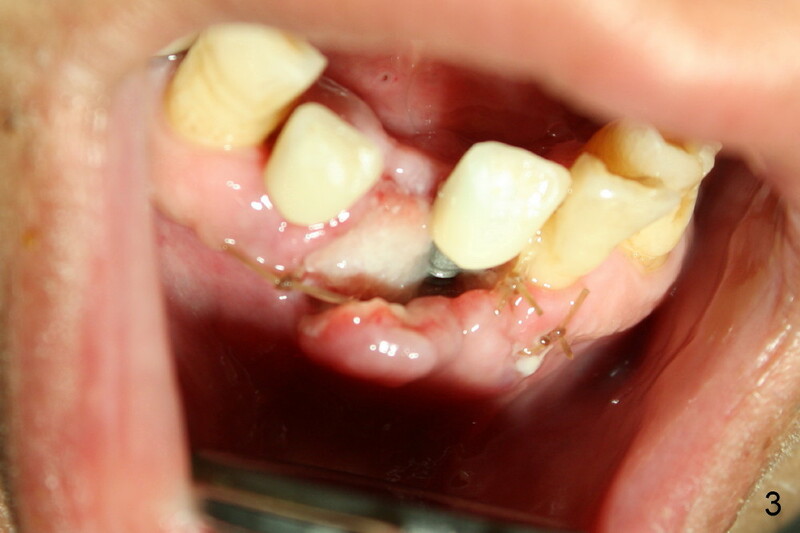 Due to deep bite, the pontic is detached quick. The mesial incision is found to dehiscence 7 days postop (Fig.3). Perio dressing dislodges one day postop. 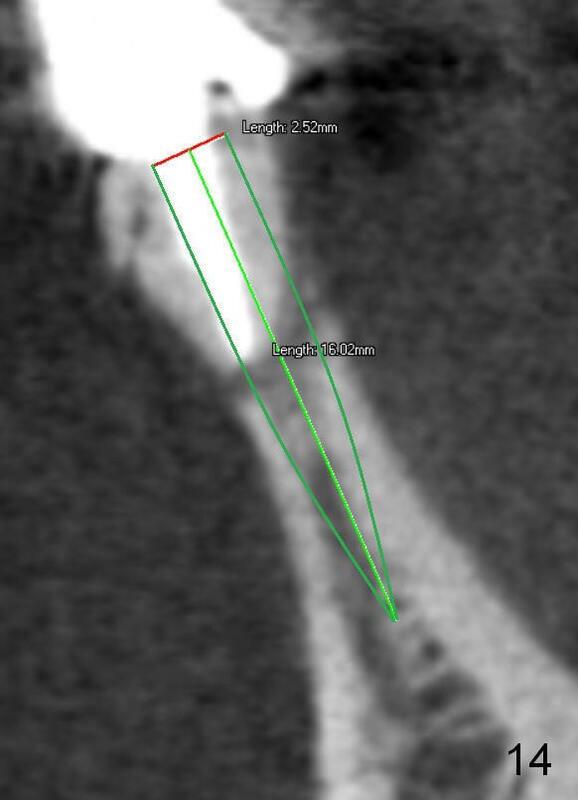 Perio dress is re-applied at follow up, but it is detached soon. Fortunately the wound shows sign of healing 14 days postop (Fig.4). The wound heals 5 weeks postop, although the top microthreads are exposed (Fig.5). In all, incision should be avoided as much as for immediate implants, anterior and posterior. The patient plans to travel abroad. 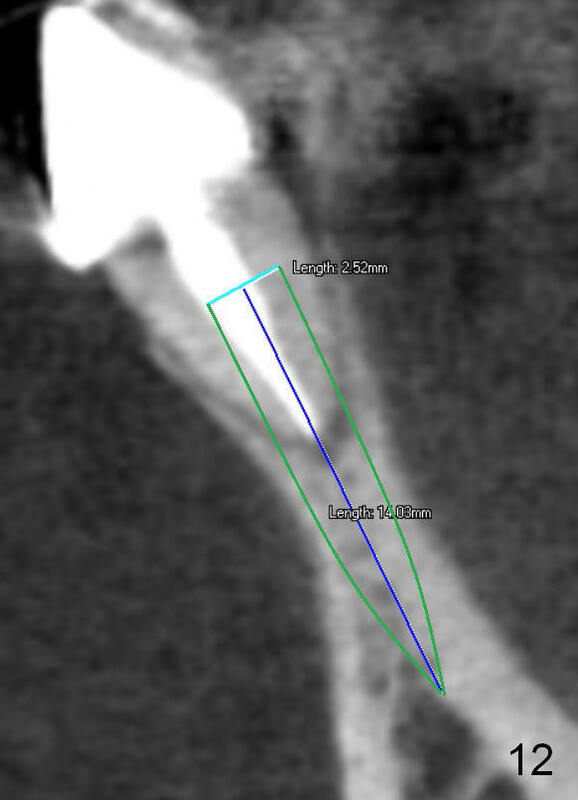 Two months ten days postop, the provisionals are removed for preparation for definitive FPD; the gingiva re-attaches to the implant at the site of #24 (Fig.6). 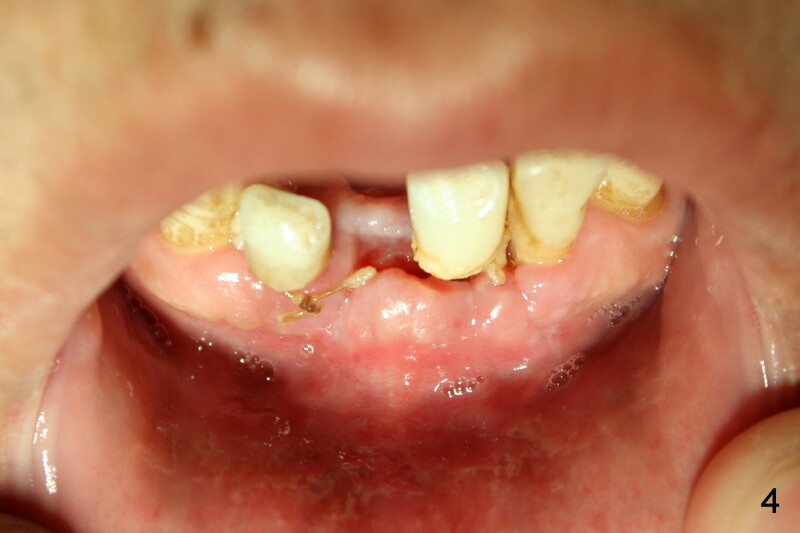 The wound dehiscence is thought to be due to over placement of bone graft. 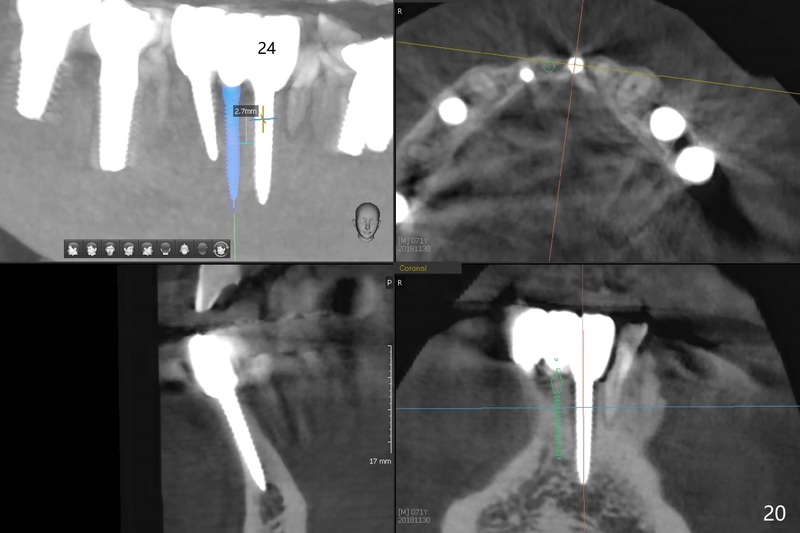 Fig.7 shows these two one piece implants immediately prior to cementation of the FPD (Fig.8). They are much more parallel to each other after prep, as compared to Fig.6. 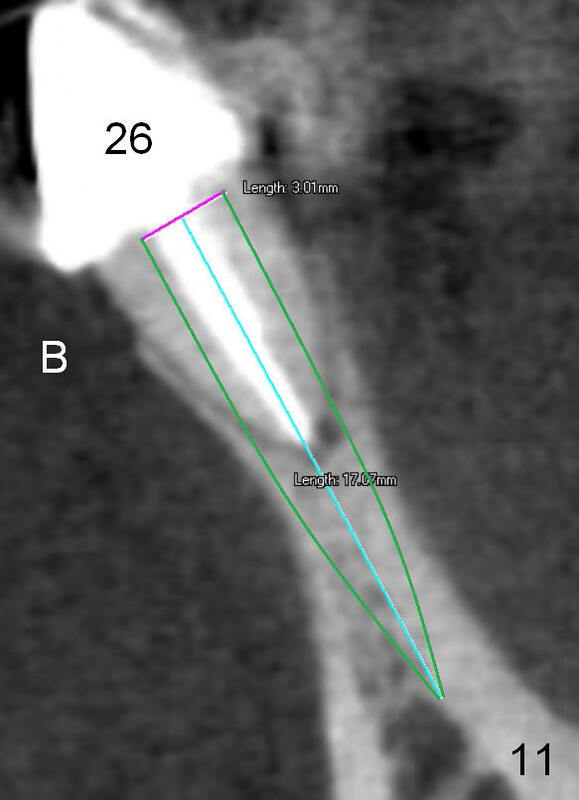 Fig.9 shows apparent bone growth around #24 implant (at the crest) 6,9 months post cementation and surgery, respectively. Orthodontic treatment will incorporate the fixed partial denture. Fig.10 shows that bone grows coronally (arrow) to cover 3 threads (from #6 thread to #3) at the site of #24 one year after functioning. 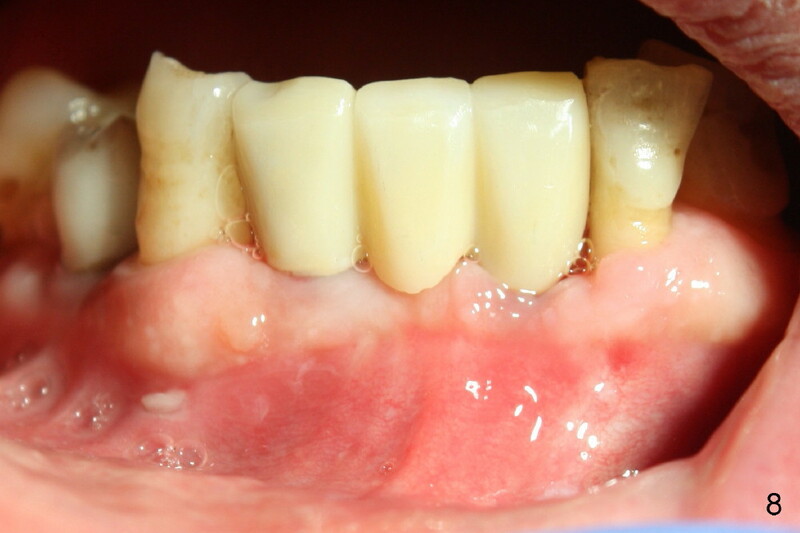 There is mild buccal gingival infection involving #26 retainer. 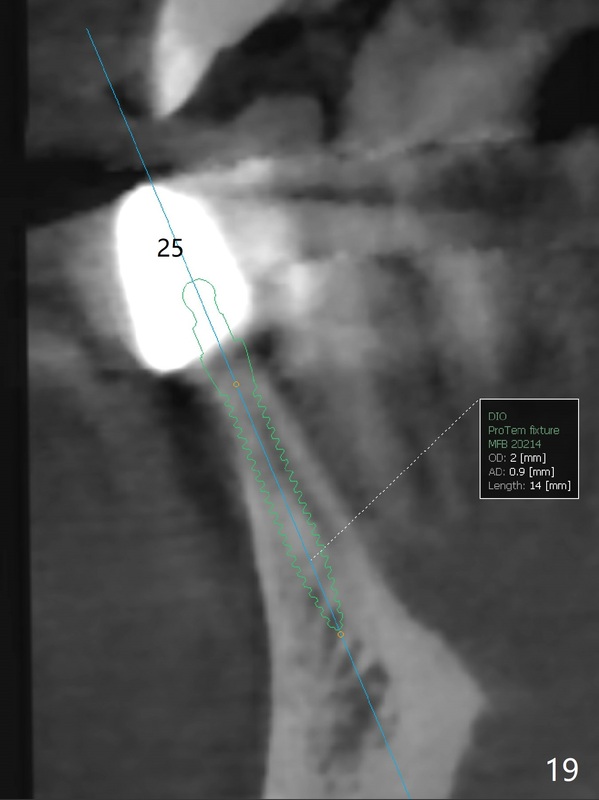 Preop CBCT is reviewed to determine whether it is related to potential thread exposure. 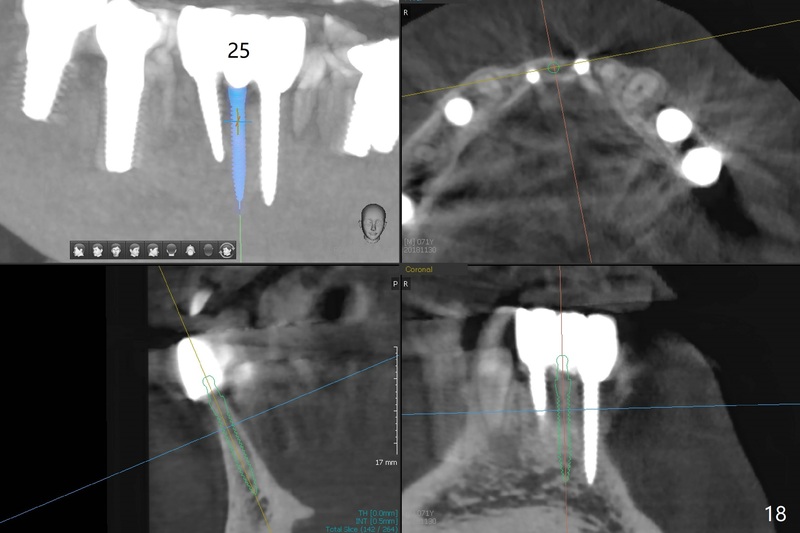 It appears that at the sites of #24 (Fig.13,14) and 26 (Fig.11,12), 2.5 mm implant is more appropriate for the narrow ridge than 3.0 mm one. 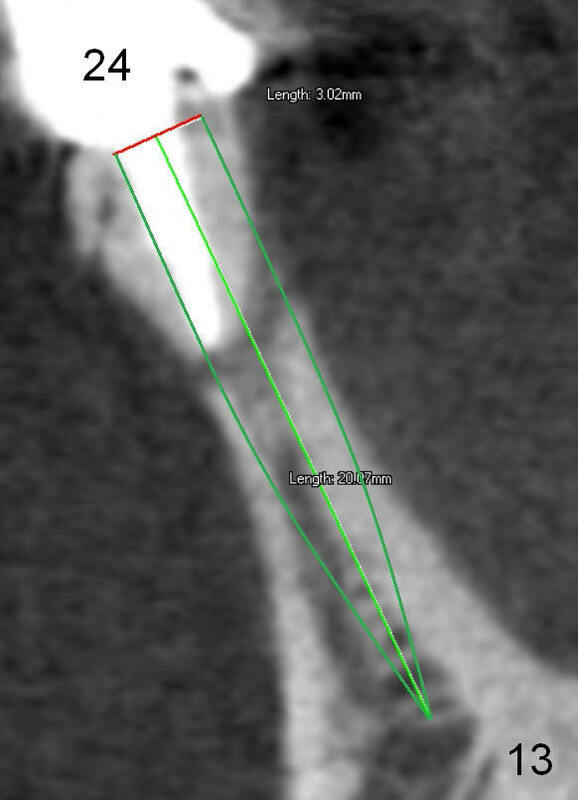 In fact, periimplantitis develops at #26 two years of absence of perio maintenance (because of atrial fibrillation with blood thinner; Fig.15, 3 years 7 months post cementation). 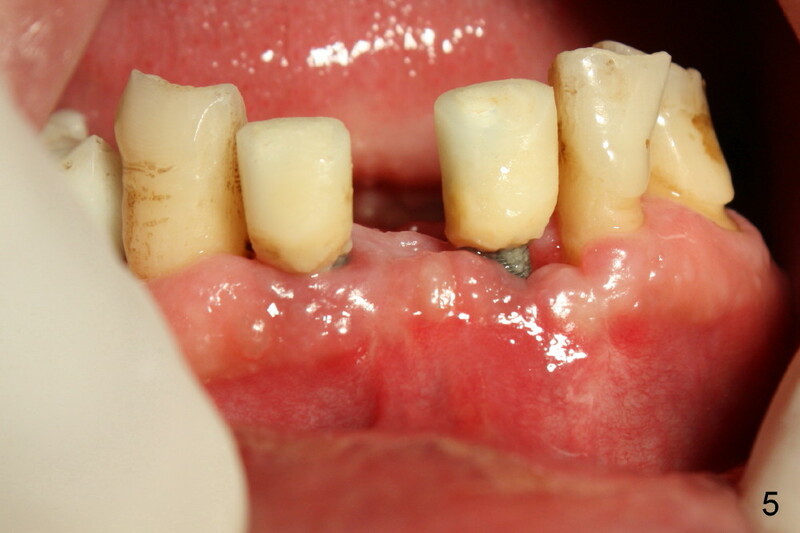 Periimplantitis persists 4.5 months later. Although water pik is purchased, it is not used often because of low blowing force. If needed, remove the FPD atraumatically. Unwind the implant, clean the coronal threads with Titanium brush or remove the exposed threads and replant the implant with bone graft. 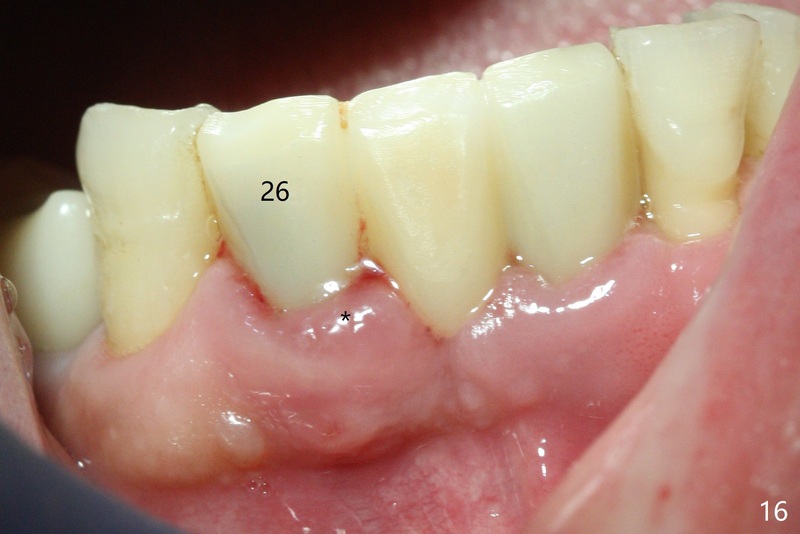 The infection persists at #26 four years 8 months post cementation (Fig.16 *). CBCT is taken. 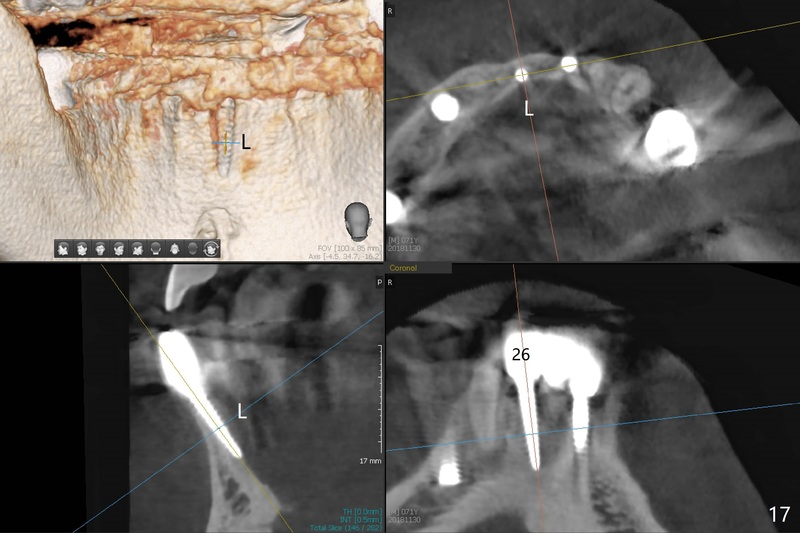 In fact the implant at #26 was placed lingual (Fig.17), while that at #24 buccal (Fig.20). 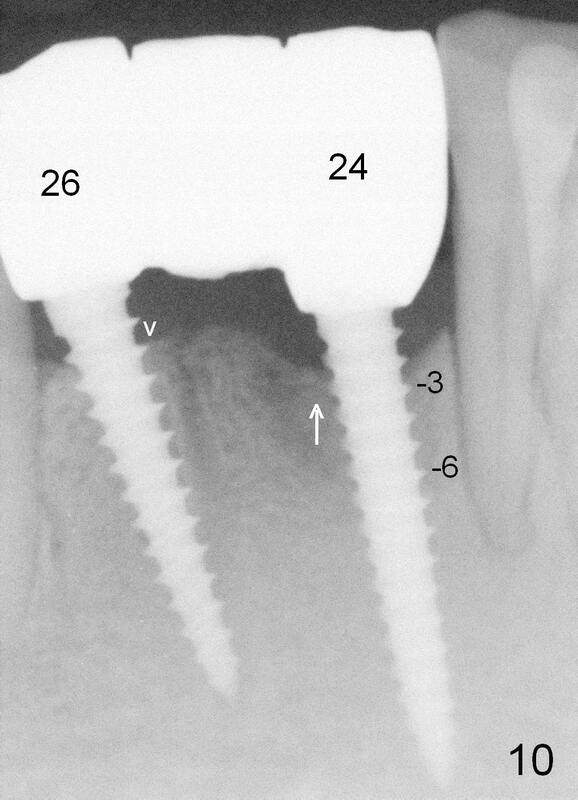 The 2nd option is to remove the implant at #26 and place a 2 mm one at #25 (Fig.18,19). Fabricate a 3-unit cantilever FPD. 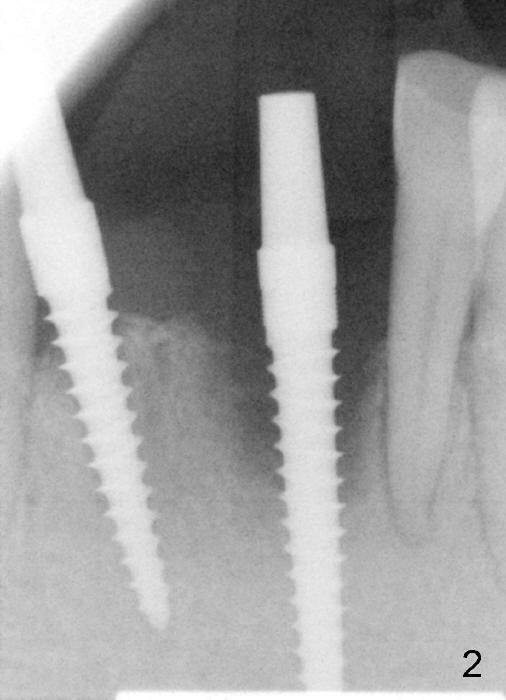 Take 5x5 cm CT with 1.2 mm drill in place for 10 mm. Change the trajectory and position if necessary.